What building in Louisiana most inspires you? K&B Plaza, 1055 St. Charles Ave.
Why do you love this building? One of my favorite buildings in New Orleans is K&B Plaza (formerly known as the John Hancock Building), designed in 1962 by the nationally renowned architecture firm Skidmore Owings & Merril. The reason I love this heavy, bulky, concrete structure is actually for its passive approach to local environmental sensitivity. Before the Modernist movement in architecture, buildings with masonry load-bearing walls tended to have relatively small windows. With the industrial revolution and advances in structural steel, Modern architecture embraced the new ability to design increasingly larger open spaces with huge expanses of glass windows. The K&B building was designed in the Modern style prevalent to the period, but the architects did something interesting to adapt the building to the local New Orleans climate. Over the exterior glass curtain walls, they wrapped the sides of the building with a concrete grid acting as a brise-soleil. 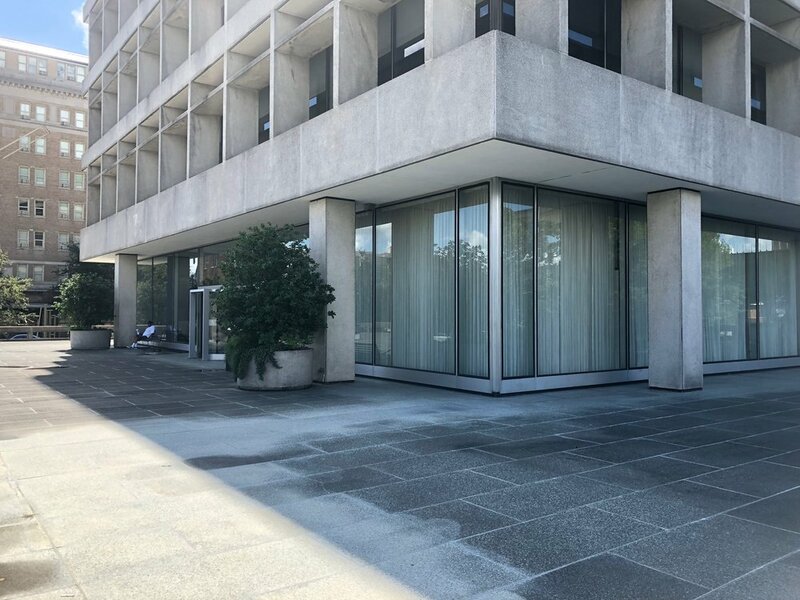 A brise-soleil is an architectural feature that reduces heat gain inside a building by deflecting sunlight before it reaches the glass on the windows. This allowed the building to have large floor-to-ceiling windows while also reducing the amount of energy required to keep it cool. The building's unique shading device also is structurally load-bearing, allowing the interior of the building to be free of columns, making the building highly functional for office spaces. K&B Plaza is still in use as an office building. 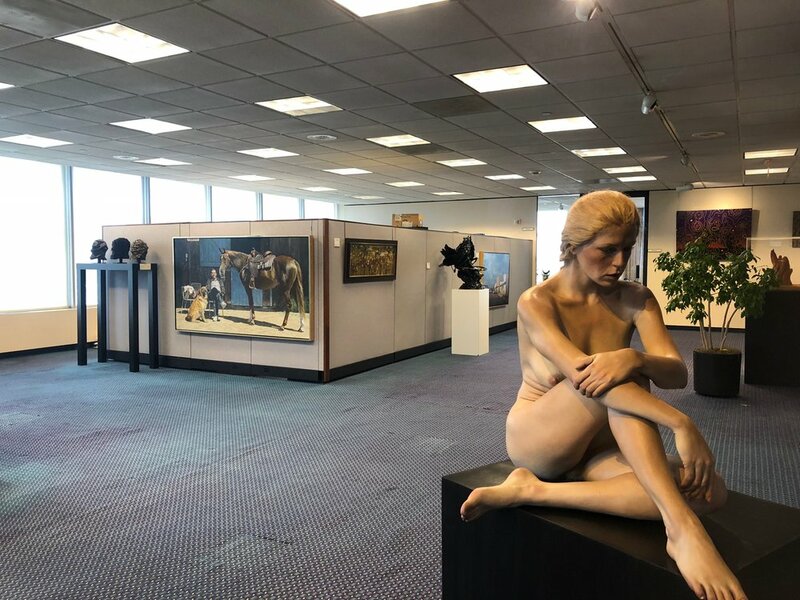 The lobby and office corridors, which are free and open to the public, serve as an art gallery lined with amazing original pieces from Sydney Besthoff's collection. The contemporary art collection is one of the best in the city and includes a sculptural fountain by Isamu Noguchi on the plaza outside. So next time you pass by this striking building, reflect on the practical benefits of its concrete exoskeleton. If you associate concrete with bulky and unsustainable architecture, take a second look at this beautiful and innovative building that uses concrete in a surprisingly eco-friendly way. Mary Gilmore has been an architect for 10 years. Some of her past projects include the Troubadour Hotel (with Campo Architects), and the Audubon Louisiana Nature Center and the New Orleans African American Museum (both with Billes Partners). This post was originally published by Susan Langenhennig with the NOLA.com | The Times-Picayune, in partnership with the AIA New Orleans chapter and the New Orleans Architecture Foundation. The original post can be found here.